Sweet music to your ears HTC Sensation 4G owners as T-Mobile updates their support forums HTC Sensation 4G channel with a May 2nd update. According to the update, Ice Cream Sandwich testing has been completed and they expect to roll out the update “very soon.” T-Mobile says to stay tuned for an “official communication” regarding the how and the when for any OTA update. 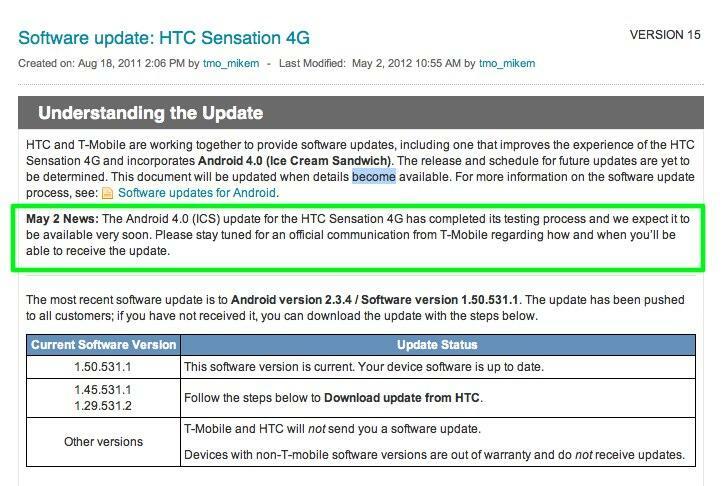 Our last bit of communication certainly told another story as it appeared the HTC Sensation 4G and HTC Amaze 4G ICS update had been pushed back to June. Unfortunately, a cursory glance at the HTC Amaze 4G support channel on T-Mobile’s website does not show the same change as the Sensation 4G. Hopefully they are far ahead of that June schedule and the Amaze 4G update won’t be far behind. In the meantime, Sensation 4G owners should keep an eye on this thread for updates. Running ICS on the Sensation past few days, running strong. From Tmo? or other XDA? Yah right how did u get that??? I’m testing it for TMO/HTC. Oop. The Bullsh** fairy left a present for you. I work for T-Mo and have been having software issues with my Sensation since day 1. Including browser and complete phone resets. Through my contacts, I have been in continuous contact with HTC, providing them with logs etc etc from my phone. Using my phone as one of their guinea pigs, every software update HTC gave me, still didn’t fix the issue. It ended up being a low memory issue. Now with ICS so far so good. Anything else you’d like to know? How well does the wifi calling work? Works well so far from my experience. I’ve only tested a few calls, I rarely need to be on wifi. Any major improvements since the upgrade? Tons of major improvements. Everything about it is just better. Crisp, clear, quick. One thing so far that I notice I’m not to fond of is during a web session the notification bar hides itself, if you get any notification(s) and don’t swipe at it right away to see it, it disappears until you end your web session. I s/w the powers to be and they stated this is normal ICS function to give you optimal viewing space on the screen. For me, I like to see the time, signal strength, battery life, but thats just me. Figures the day i drop my Sensation shattering the digitizer and deciding to order a Galaxy Nexus to replace it so i dont have to wait for carrier updates and theres finally progress on the Sensation ICS update. Cool, that’ll up the value of my HTC Sensation 4G before I get rid of it. i cant wait. i honestly i need the sense update also. a lot ot the time when i exit an app, sense has to reload itself and im stuck waiting like 15 seconds to do anything else. How exactly did u do it? I’ve been meaning to root it, but I’m not sure how. XDA has instructions on how to root your phone, get S-OFF, and superCID. Once that’s done, scroll through the available ROMs until you find one you like. Then, let the addiction of flashing ROMs begin. Thanks tmo_mikem, now I can quit complaining about how long the update is taking and complain about how long the update took . Don’t worry. You’ll still have a period of time here to complain before the official communication haha. I think people are already feeling the Sensation of Rooting. I see what you did there. Are you trying to Amaze us? Behold!!! We have a winner here. Your prize is a new S3 in a Prism of color choices, starting tomorrow. The Galaxy isn’t that far away if you come to think of it. What, are you trying to Defy science here? That would be an Astounding discovery!!!!! iDon’t know how to respond. The comments you guys have made are cutting age. Almost Razr like. I applaud him for being Bold. At least he’s not trying to make words Rhyme. haha. Thank you! Not to sound ungrateful but I was hoping for more than One prize. But then you’d have to split half of your winnings with your X. She will likely keep her half as a Memoir of your relationship. She would have stayed with ya if you had the right amount of Charm. He tried to make an Impression on her by giving her an Epic Pearl, but it wasn’t Bold enough to match her Desire. One day soon she will miss MyTouch. Best thread I’ve seen in a while, beyond a Shadow. yay!!!!!!!!!!!!! about time whew!!!!!! Cant wait!!!!!! The Sensation is one of the easiest rooting processes out there. The only thing easier are samsung phones. S-off with revolutionary then superCID then flash RevHD. I now have a Sensation running at 1.5GHz X 2 with Beats Audio and have a 768MB partition on my SD Card for virtual RAM….. ICS is smooth as butter and I have great battery life.. You can even get a sense 4.0 rom if you wish but 4.0 is ugly. My sensation has been running great on ginger bread, so I don’t mind the wait may or June either way its good . I’m checking for an update every half hour for the next two weeks lol. My sensation suffers from the white HTC loading screen for about 5-10 seconds every time I exit any application. Anyone have a fix?! Fact data reset didn’t help. Also my RAM averages about 120mb free. HELP! It happens to all Sensations. With 768mb of RAM, I see the white screen like 10 times a day. Using Go launcher made the ram use age drop to below 300 every time. Try it out. yeah i use Go Launcher EX and it never lags on me no joke..
Never knew anything about this!! I’ve immediately downloaded Go Launcher. Will test this out!! There are plenty of GoLauncher ICS themes to hold you over until the real ICS release. It may take a while to find a free one that suits you but there are many to choose from. Also, get GoLock and get the ICS lock. :) The GoWidgets are amazing as well especially the weather one. It made my GS4G have a new lease on life!!! Yeah, that’s totally true. I use GoLaucher Ex. It solves the problem. Been wanting to do this but am confused – read somewhere that it doesn’t actually replace the Sense launcher, but sits on top of it. Something along those lines. Your testimony and other’ here suggests that can’t be the case, but I thought Sense was still running in the background even if Go launcher (or other replacement launcher) was installed and visible on top. Agreed. I’ve been using Go Launcher for several months for this very reason. It does solve the issue and is very responsive. Only drawback is that you need to switch back to Sense to customize the lockscreen, and you also lose the HTC widgets. Go Launcher has plenty of options and eye candy though. It’s the default HTC Sense Launcher using too much memory and needing restart. That was totally HTC’s fault for only putting 768mb in ram or bloating sense 3.5 too much. Use a 3rd party launcher it will fix your problem. Ya this is one of those HTC SENSE issues that prompted me to ditch that POS for the GS 2. HTC and Tmobile REFUSE to acknowledge they released a defective phone. Same BS happened on the Mytouch 4g. I (and others) have posted a fix for this on XDA multiple times, yet no one seems to search before complaining. The fix is easy. Search and you shall find! done a lot of searching and no definitive, widely accepted solution seems to exist… are you talking about the build.prop solution? Happened all the time to my Amaze before I got my ICS update yesterday. I still say it going to be June, T-mobile tell us enough to keep us at bay. They probably had the update from the beginning but want to get the htc one s sales. I don’t believe nothing tmobile say. They said they was going to stop the messages on our phone but they didn’t. T-Mobile just announced that ICS will be available for download starting on Wednesday, May 16th, 2012. One thing I was hoping someone can clarify. With ICS, on TMOBILE’s site it indicates: Note: HTC Sensation 4G will be required to add Wi-FI Mobile Hotspot after the update. Android 4.0 (Ice Cream Sandwich)Sense 3.6System bar enhancements to easily view recent apps.Re-sizeable widgetsLock screen actions including pull down notifications and adjust volume while device is locked.Data usage controls.Face UnlockHome screen folders Improved battery lifeNote: HTC Sensation 4G will be required to add Wi-Fi Mobile Hotspot feature in order to use the service after completing this update. Does this mean that one will need to activate this service at $14.99/month in order to use it? Currently it is included. Thoughts?